Our biodiversity survey has been blessed by a highly skilled and generous team of experts. Names marked with an (*) participated in the original May 24, 2008, bioblitz event and have continued to support the effort with return visits and assistance with identification. Unmarked names have joined the effort following the initial event. Wilbur Bluhm Wilbur is at home in the Oregon wilderness. The now retired professor of horticulture has traveled to all corners our state to photograph more than 1,500 plant species native to Oregon and has given many programs on native plants to audiences throughout the Pacific Northwest. He is also an active volunteer with the Oregon Plant Atlas Project, having contributed more than 65 plant checklists and suggested several new taxa to the Oregon Vascular Plant Checklist. Joe Ebersole Joe is a research fishery biologist with the US Environmental Protection Agency. His research focusses on the ecology of stream fishes. He has played in and around streams for nearly 40 years. He’s still not tired of it. Lisa Ebersole Lisa is a botonist . Bruce Eder Bruce is a retired vice president of operations for Tree Top, Inc. and travels the world as a bird enthusiast and experienced photographer. Janet Eder Janet is s former teacher, a busy grandmother, and travels the world with her husband on birding trips. She lead children’s bioblitz activities. Roy Gerig Waldo Middle School Science teacher and Conservation Director for Salem Audubon Society . Jennifer Gingerich Jennifer is a former elementary school teacher and technology trainer presently a certified trainer and application manager for Discovery Education. Jennifer is our Bioblitz videographer. John Gingerich John has 40+ years of experiences with Drift Creek Camp including many trips to DCC for summer camps, family reunions, fishing trips & retreats, annual meeting and volunteering. Now he serves on the DCC board of directors and Nature Center board. John is our Bioblitz planner and data recorder/reporter. Conrad Gowell Conrad was first introduced to Drift Creek on a family fishing trip at the age of 10 and in the 10 years since, has spent countless hours on the stream. He has just finished his junior year at the University of Puget Sound studying the vitality of upper Drift Creek in comparison to the Sampson Creek tributary. He plans to earn a graduate degree in Fisheries Ecology from the University of Washington. Shelley Gowell Shelly is an Entomologist . Jake Hurlbert Jake has a background in biology. He has long been involved with the local Native Plant Society where he saw that there was not a lot of local knowledge about mushrooms so he started learning about the fungi and has never stopped. 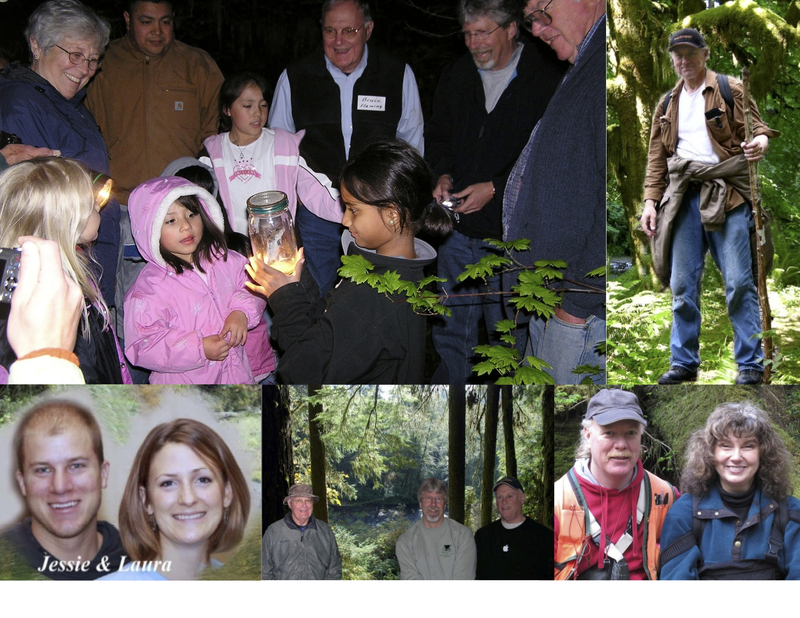 Lorelei Norvell President Pacific Northwest Mycology Service. Laura and Jesse Sigmans Laura and Jesse served as onsite staff at Drift Creek Camp in 2009 greatly enhancing the Nature Information Center and onsite trail system. Laura is an elementary school teacher and outstanding photographer; Jesse has a degree in Environmental Science and experience in Environmental Services. Lowell Spring Lowell is a retired Western Oregon University professor whose specialty is birds. Crystal Apple Awards winning Science teacher at North Salem High School. Marty Stein Forest Botanist, USDA Forest Service, Siuslaw National Forest, Waldport, Oregon. Education: B.S. in Forest Management. Experience: 18 years as a botanist on national forests in Oregon and Washington, 5 years as a forester, agro-forester, and forestry technician. Rich Swartzentruber Rich is a science teacher at North Salem High School, knowledgeable in plant and animal life and an excellent photographer. Jon Yoder After twenty-three years as a science teacher at North Salem High school Jon is currently the Salem-Keizer School District’s Science Program Assistant, coordinating and supporting science programs in the schools. He has been involved in coordinating the Mill Creek project, a restoration and educational project along Mill Creek, and efforts to build the Straub Environmental Learning Center. Jon is also the Secondary Education Coordinator for the Northwest Center for Sustainable Development, which involves conducting teacher institutes and writing educational manuals. He is a Bioblitz planner and participant.